I hesitated calling this school supplies or office supplies or what have you, simply because I’m including it here – in June, the notable end of the traditional school year – for a multitude of reasons. As always with these twelve-month ideas, you could gift someone with a special surprise every month using these sources (a particularly cute idea if say, you’re married to a teacher). Or you can just use them as go-to places when you’re shopping for a graduation gift, a back-to-school incentive, a congratulations to a fellow coworker on a job well done, or a thank-you gift for a teacher. Since 75% of those things are happening right about now (and school is two months away, which ain’t that far in gift-giving land), I present to you my list of twelve items that’d be right at home in anyone’s desk, office, or book bag. Inspire Notebook – $10 @ Indigo – Jot down lesson plans, classroom notes, or to-do lists in this charming take on an apple for teacher. Breffo Spiderpodium Mobile – $19.99 @ jack + jade home – Flexible & functional, this multi-tasking tool is a must-have for video chats. Clementine Art Natural Crayon Rocks – $6 for 9 @ JetPens – Eco-friendly & charmingly bright, these’ll add a welcome pop of colour to any desk. LOL Cats Desktop Mood Chart – $7.99 @ Parkside Paper – Tell the world how you’re feeling, one kitteh at a time. Chalkboard Office Accessories – $4.95 – $49.95 @ CB2 – Make like a teacher and jot down notes to make your desk organization that much better. Alessi Dozi Magnetic Paper Clip Holder – $27 @ Gabriel Ross – These quirky porcupines are just waiting to be re-spined with your metal paper clips. Desk Calendar – $18 @ Snow & Graham – A little late for this year, sure, but consider this a go-to spot for future pretty desktop scheduling solutions. Sherpa Pen Shell + Sharpie Marker – $29.95 @ Kate’s Paperie – Cover up the grisly grey case for your favourite Sharpie and ensure the ink stays fresh & crisp. Ocean Print Masking Tape – $10.95 @ Artis & Grove – Ideal for scrapbookers or customizing your other favourite desk supplies, or wrapping one of these gift ideas! Utility Task Clips – $9 @ Knock Knock – Keep serious tabs on the state of affairs covering your desk with these pastel ‘to-do’ clips. 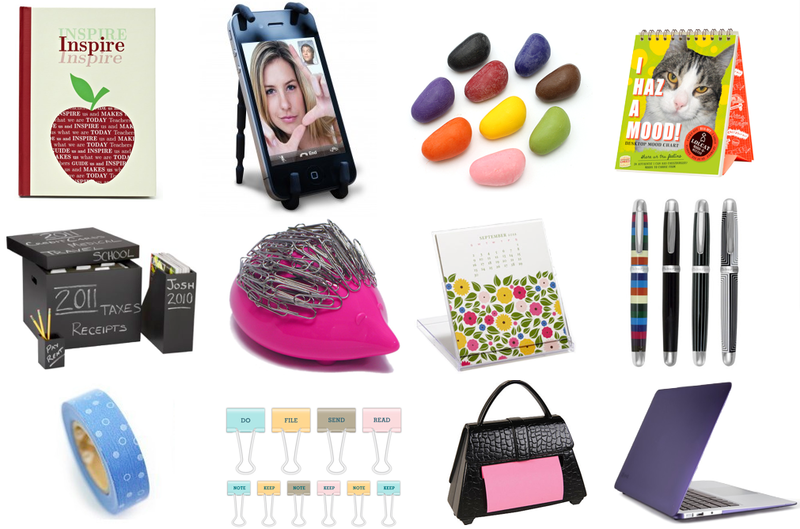 Post-It Pop-Up Note Dispenser – $14.99 @ Staples – A girly find for the resident fashionista in your office. SeeThru SATIN Cover for MacBook Air – $49.95 @ Speck – What’s a desk without a computer these days? Pretty yours up with one of these satiny, colourful cases. Wow! Lots on practical things!! I love all of the items but have a cruch for the cat thing. Wow! j`en aurait bien besoin de tous ces trucs de bureau! !